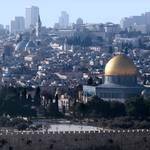 Israel’s economy is exceptional in the Middle East. Without abundant resources such as oil and gas and with a small population, Israel outperforms all other regional economies, with exception of a few petroleum fuelled Arab Gulf economies. Israel’s GDP, which reached 242.9 billion USD in 2011, is twice that of Syria, Jordan and Lebanon combined. In other words: with 7.5 million inhabitants Israel produces twice as much as the three other countries together, whose combined population is four times the size of Israel’s. As a result, on average Israel’s economy is eight times as strong as that of its Arab neighbours. Comparison with its closest neighbour, the Occupied Palestinian Territories, reveals an even cruder disparity. Israel’s economy is roughly forty times larger than that of the Palestinians in the West Bank and in the Gaza Strip, while its population is not even twice that of the Occupied Palestinian Territories. Whereas Israel may come across as an economic giant in the Middle East, its economy is much more modest compared to Western European countries. Israel’s economy is much more dynamic and productive, however, although it also draws substantial benefit from large capital transfers and preferential trade agreements with the United States and the European Union. Principal characteristics of Israel’s economy do however resemble those of European states such as Germany, Great Britain or the Scandinavian countries. It diverges from these countries, however, in its crucial structural imbalances, such as very low labour participation and high incidences of poverty. Israel’s economic resemblance to European countries stands in striking contrast to that of its Arab neighbours, such as Jordan and the Occupied Palestinian Territories. Many Arab non-oil economies are characterized by tight control of state bureaucracies. Industrial and commercial firms in Arab non-oil economies are usually small family driven enterprises, producing elementary goods and services. Agricultural sectors contribute relatively little to national productivity but are vital in providing affordable food security for the majority of the citizens. Such economies are often trapped in low labour productivity, under conditions of on-going demographic growth. Israel’s economy has gone through a number of crucial stages in its development from the year of its foundation in 1948. Up till the 1990s, Israel’s GDP expanded fourfold, in line with high general global growth levels in that period. Israel took benefit from two crucial factors: human capital and financial capital. Jewish nationalism had established a strong ethos of political and socio-economical purpose and achievement. It contributed to placing Israel third in rank of number of university graduates per capita, after the United States and the Netherlands. It also contributed to exceptionally high-tech productivity, which partly stemmed from the urge to maintain an upper degree in the country’s military defence. Huge influxes of financial aid, in the first place on account of German reparations and transfers from the United States, the latter largely for military purposes, gave impetus to capitalize on the country’s ever expanding demographic resources. Today, Israel’s economy can be characterized as strong and dynamic on the whole. But there are substantial imbalances between key sectors, giving rise to serious concerns. 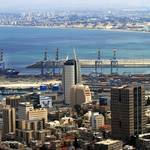 The bulk of Israel’s industrial enterprises are concentrated in the country’s extended metropolitan agglomeration, stretching from Greater Tel Aviv to Haifa in the north and to Ashdod and Ashkelon in the south with satellite locations in Jerusalem and a number of smaller provincial cities. This concentration of industrial locations is a mixed blessing. 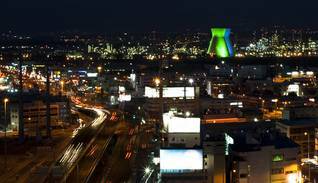 Most Israeli industries are located in dedicated industrial zones on the outskirts of cities, with generally easy access to the country’s road network. Location advantages are however increasingly jeopardized as a result of Israel’s seriously undeveloped transportation infrastructure. There is a huge discrepancy between vehicle density and actual road capacity, particularly at peak hours, causing huge traffic jams. For decades Israel’s governments have neglected the country’s transportation infrastructure, remaining almost exclusively fixated on minimal motorcar mobility, resulting in a grave lack of multi-lane thoroughfares and adequate rail services. When the wheels appeared to grind to a halt, the moment arrived to stir Israeli politicians and officials into action in the late 1990s. A number of cumbersome road bottlenecks were improved and a whole new toll-highway was constructed running from north to south (Road number 6). 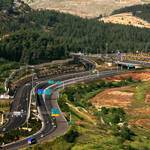 Israel had 18,470 kilometres of road in 2010 (World Bank). Substantial funds were being invested in upgrading Israel’s obsolete railway system, adding new lines and stations and preparing for large-scale electrification of the main routes. Relief soon became apparent with an increase of rail passengers from 5 to 35 million in just fifteen years time. The total length of Israel’s railway increased from 676 kilometres in 2001 to 1,034 kilometres in 2011 (World Bank). 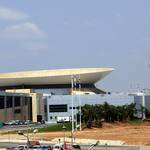 Israel has also managed to upgrade the country’s main national airport of Tel Aviv-Ben Gurion into a modern facility capable of handling the anticipated increase in freight and passengers. More than 5.3 million passengers were carried in 2011, compared to 3.9 million in 2001 (World Bank). Despite these marked improvements, Israel is still lagging behind in comparison with advanced Western European countries. One particular bottleneck is the lack of adequate mass transit systems in the country’s biggest cities, such as free bus lanes, tramlines and underground railways. Ambitious plans for improvement have been prepared but are making slow progress. The Israeli gross domestic product (GDP) in the year 2015 had reached 299.42 billion US dollars, in comparison with 308.77 and 293.31 billion dollars in the years 2014 and 2013 respectively. In the year 2015 the GDP per capita had reached 35770 dollars, in comparison with 35670 and 34430 in the years 2014 and 2013. The Israeli economy had witnessed in 2015 a grow with a rate of 2.5%, in comparison with 3.4% and 4.4% in the years 2014 and 2013. The World Bank predicts that the Israeli GDP will grow in 2019 by a rate of 3.3%. In December 2016, officials from the Bank of Israel confirmed that the Israeli economy had achieved a grow with a rate of 3.5%, pointing that the growth rate will decrease slightly in the years 2017 and 2018 to reach 3.1% and 3.2% respectively. The inflation rate had reached 2.8% in 2015, in comparison with 1.1% and 2.1% in the years 2014 and 2013. According to the International Competitiveness Report for the period stretching between 2016 and 2017, Israel had came in the 24th rank, in comparison with the 27th rank in the period stretching between the years 2015 and 2016. This goes back to its being one of the most able economies in terms of innovation in the world (second at the world level). The industrial sector contributes 31.4 percent to the country’s GDP (CIA, 2012)and employed 20 percent of the labour force in 2009 (most recent available, World Bank). It delivers three-quarters of Israel’s exports, making up circa half of its total output, which is a notably high proportion. 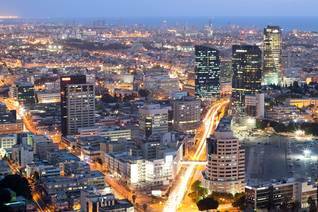 Israel’s industries absorb more than one-third of the country’s investments. On the whole, the sector is extremely diverse, exhibiting sharp contrasts in scale, turn-over, labour productivity and levels of applied technology and by implication amounts of invested capital. For years on stretch, traditional, labour intensive manufacture dominated the industrial landscape. In terms of employed workers and number of factories it still does, but modern industries are gradually taking the upper hand in vital capital-related fields. During the past decades the gap between relatively low value-adding industries in branches such as textiles, food or plastics and new, dynamic high-technology driven manufacture, such as electronics, fine machinery and computer hardware has widened dramatically. High-tech manufacture makes up 80 percent of the total industrial exports, twice as much as all other manufacture and at much higher profits. It employs much fewer workers proportionally, who are much higher skilled and much more productive. This imbalance with traditional industries is a matter of rising concern for Israeli economists and politicians, particularly with regard to the issue of employment opportunities, which are skewed in favour of highly educated personnel. Today the division of high-tech industries, together with the branch of ICT services, has become the locomotive of Israel’s economy. In recent years, especially in the last decade, a number of highly dynamic innovative firms have been making headway. These are companies in the spheres of electronics, telecom, computer engineering, fine chemicals and pharmaceuticals carrying famous brand names such as Eltek, Alvarion, Teva, Aladdin, Delta Galil, Gilat, Vishay, and Elisra, all of which are positioned in the first echelons of global competitiveness, earning high export revenues for Israel. Israel’s military industries occupy a special place in this division. Over the decades arms manufacturers such as Rafa’el, IAI and Ta’as have hugely expanded in scale and levels of sophisticated armoury, upgrading from producing basic fire arms to complicated weapon systems with a high technological content. Israel’s military industries – benefiting from huge public investments underpinned by decades of formidable financial transfers from the United States – were crucial in delivering vital so-called ‘spill-overs’ to the advanced modern industries of today, both in highly skilled professional manpower and in technological expertise. High-tech exports accounted for 14 percent of manufactured exports in 2011, with a value of 8.8 billion USD. Export of ICT goods accounted for 10.7 percent of total goods exports (World Bank). Arms and security services account for roughly a quarter of Israel’s industrial exports and about 20 percent of industrial employment. In the last decades Israel’s arms exports have reportedly increased more than twentyfold, making the country the fifth largest arms exporter in the world. Another special branch worth mentioning is Israel’s diamond processing industry, good for yearly exports regularly exceeding 10 billion USD. Whereas Israel’s high-tech firms are prominent eye catchers in the global economic arena, a considerable number of traditional Israeli firms which are active in for instance food processing, tool making or home applicant production, such as Osem (currently incorporated into Nestlé), Tnuva, Prigat and Elbit are holding ground on the Israeli consumer market. The still deficient transportation infrastructure is just one element limiting Israel’s global economic competitiveness. 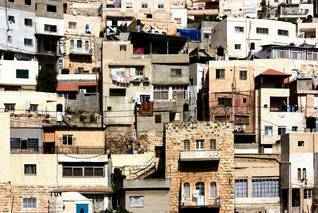 Israel suffers from the marginalization of peripheral regions. 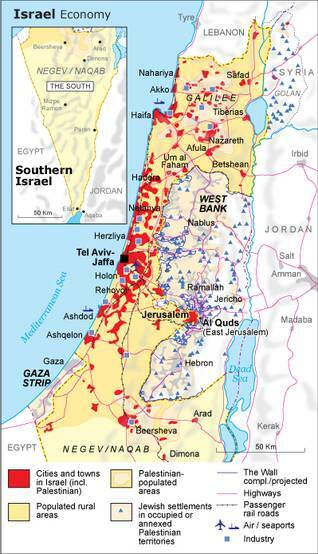 The country’s most peripheral regions are the Galilee and the Negev, both with prominent Palestinian populations. Israeli politicians and civil society leaders have continuously raised alarms about governmental policies that have further deepened the prominent marginalization of these regional communities. These make up 20 percent of Israel’s population but contribute only about 8 percent of the country’s GDP. After governmental expropriations of most Arab communal landholdings, and a considerable proportion of private landholdings, Israel’s Palestinians are left with less than 4 percent of the land. While only 8 percent of the working population manages to continue farming, most have become dependent on menial jobs in small workshops, traditional factories or hotel and restaurant catering. The Galilee and the Negev are prime examples of a dual problem in the socio-economic development of Israel. Both regions are remote from the country’s metropolitan core, while their Palestinian inhabitants are hampered by a difficult transition to non-agricultural livelihoods. 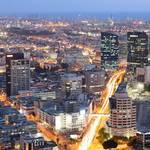 It has prompted visionary Israeli entrepreneur Stef Wertheimer to elaborate on the advantages of the country s industrial zones. He advocates establishing new special industry parks in marginal areas where land and labour are plentiful and much less costly than in the metropolitan centres. Such industry parks are meant to offer more than just location and investment advantages in providing vocational training on the spot to unskilled and undereducated workers as a part of their jobs. 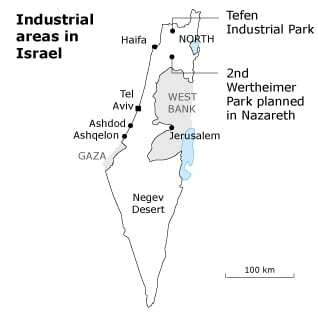 The first of the envisaged facilities was the Tefen Industry Park in the Galilee, which became a widely acclaimed success, not least in delivering an impressive 10 percent of Israel’s industrial exports. The Tefen formula gave inspiration to establish more industry parks in both of Israel’s peripheral regions and is even being exported to countries such as Turkey and Kazakhstan. Israel’s agricultural sector contributes 2.5 percent to the country’s GDP (CIA, 2012) and generated 1.7 percent of total employment in 2009 (World Bank). It provides 3 percent of Israel’s exports and absorbs a similar percentage of the country’s economic investments. With such minute figures the sector seems barely significant within Israel’s economy as a whole. But as such, these figures fail to convey the sector’s current and past importance. Agriculture has been fundamental to the formation of Israel’s national and geopolitical identity. It became instrumental in laying the territorial basis for the Jewish State prior to the Declaration of Independence in 1948. In the early decades of the 20th century, Jewish agricultural settlements had multiplied from less than 50 to more than 250, with a tenfold increase of its farming population, making up a quarter of the country’s Jewish population and defining a territorial extent which made up 7 percent of Palestine. The value of agriculture was recognized in equal measure as providing food security for the Jewish immigrant population as well as gaining territorial control. This double purpose prompted huge public investments in agriculture once the Jewish State was established in 1948. Israel’s political leaders felt the urge to maximize the cultivation of arable land, and to secure the required amounts of water for irrigation up to the point of exhausting these precious resources. Although Israel had managed to take control of ten times more land than it possessed before the War of 1948-1949, the anxiety of having control over insufficient natural resources remained equally high. Intensifying the cultivation of lands required far more water than could be obtained locally. It brought Israel to invest heavily in water works, culminating in the construction of the National Water Carrier. In practice this conduit came to nothing less than an effective diversion of the Jordan River away from Lake Tiberias in the north and southwards to the central plains and the Northern Negev. It enabled Israel to more than double the cultivated area and to expand the irrigated surface more than eightfold. In the 1950s, agriculture became Israel’s landmark ideological and economical foundation, making up close to a third of the country’s GDP and employing hundreds of thousands of new immigrants. Despite the enormous increase in agricultural production, Israel continued to strive to make maximum use of minimal amounts of water in cropping land. It motivated Israel to commit huge financial funds to developing water saving techniques, such as drip irrigation and sewage recycling, making the country a world leader in resource saving agricultural techniques and methods. Since the 1970s, the sector has been experiencing dramatic changes. Mechanization began to supplant manual labour, while farming incomes started to dwindle in comparison to salaries in other sectors. The number of farms decreased to almost half their former quantity, while most agricultural communities traded initial collectivistic principles for the motive of private tenure, income and profit. The sector began to rely on cheap foreign labour, first of Palestinian workers from the West Bank and the Gaza Strip after Israel had occupied these territories in 1967, later of workers from East Asia and Eastern Europe to replace the Palestinian workers who were barred from the country in consequence of Israel’s policies since the early 1990s. Around three quarters of the agricultural workforce is made up of lowly paid hired hands from abroad. 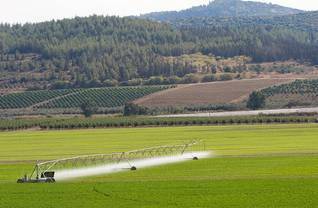 Today Israel’s agriculture has a mixed record. On the one hand it still provides extensive food security with a wide range of vegetables and fruits, while earning vital foreign revenues in exporting greenhouse produce and flowers, mainly to Europe. On the other hand there is increasing awareness of its downsides. Questions are being raised in Israel about the over-exploitation of land and water resources with the accompanying relatively high incidence of soil contamination. The value of agricultural output in 2012 was 28.9 billion NIS (8.1 billion USD), according to the Israeli Central Bureau of Statistics. Of this output, production of crops amounted to 17.4 billion NIS and livestock and their products amounted to 11.6 billion NIS. Of the total of Israel’s production, the following were top 10 commodities (ranked in quantity): cow milk; potatoes; indigenous chicken meat; tomatoes; carrots and turnips; chillies and peppers; grapefruit; vegetables fresh nes; tangerines, clementines, mandarins; apples (FAOSTAT). The services sector is Israel’s largest economic sector. It contributes 66.1 percent to the country’s GDP (CIA, 2012) and employs 77 percent of the labour force (World Bank). It is responsible for a third of Israeli exports, but consumes two-thirds of the country’s investments and public spending. The value of service exports in 2012 amounted to 110.9 billion NIS (31.2 billion USD), according to the Israeli Central Bureau of Statistics. Even more so than the industrial sector, the services sector is a highly diversified conglomerate of smaller and larger private firms and of public institutions and enterprises, most of which are facilitating services. There are also enormous contrasts between high-end and low-end services, the former consisting, for instance, of business consultancies, real estate management and accountancy firms. Because of its broad economic spectrum the whole sector is conventionally divided into sub-sectors, firstly public and private sector enterprises. The division of public services employs almost half of the sector’s total work force. The biggest spenders among governmental institutions are those providing health care, education and welfare. Overall appreciation of Israel’s public health care and education is evident. But a growing number of Israeli political and economical analysts are pointing at a number of worrisome deficiencies, especially in the country’s educational system. Israel spends much less on secondary education compared to the budget for academic tuition, while standards of primary education are giving reason for rising concerns. Scores of Israeli pupils in standard global tests are disappointingly low and the number of secondary school drop-outs is alarming. Concerns have also been expressed about the lack of uniform educational standards. Public schools and some (but not all) schools operated by religious institutions are often badly equipped and performing below expectation. Too many governmental bureaus and institutions are regularly featuring in Hebrew news reports with complaints about lengthy, time and money consuming procedures, questionable regulations and high levels of corruption. These are key factors which are measured and processed by world socio-economic research institutes such as the Global Competitiveness Index (GCI), disclosing vital insights into public service effectiveness of national economies. According to this index Israel’s public sector is remarkably inefficient compared to advanced European states, such as Germany, Great Britain, the Netherlands and the Scandinavian countries. All data mentioned here are from the US Energy Information Administration. Israel’s energy sector is governed by the Ministry of National Infrastructures, which gives overall guidance to the sector and oversees the state-owned energy companies. The most important of these companies is the Israel Electric Corporation, which until recently had a monopoly in all aspects of the sector. Israel imports all of its coal supplies, and all but an insignificant amount of the crude oil. 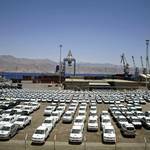 In addition to refining products at its two refineries, Israel imports finished petroleum products. The imported coal is used exclusively for electrical generation. The coal is sourced from a number of countries, the largest supplier being South Africa. 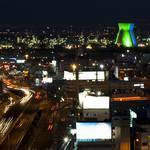 Israel consumed 15.4 million metric tons of coal in 2012. Israel produced about 41.7 billion cubic feet of natural gas in 2009. This is a small amount compared to the countries of the Persian Gulf, but it is a large step towards greater self-sufficiency. The start of natural gas production in 2003 came about as a result of the discovery of the 27 bcm Mari-B gas field in 1999. It is about 25 kilometres off the coast of Ashkelon. This field was discovered and developed by a consortium of Noble Energy from the United States and Delek Drilling and Avner Oil Exploration from Israel. The field will be rapidly depleted, perhaps by 2014-2015. 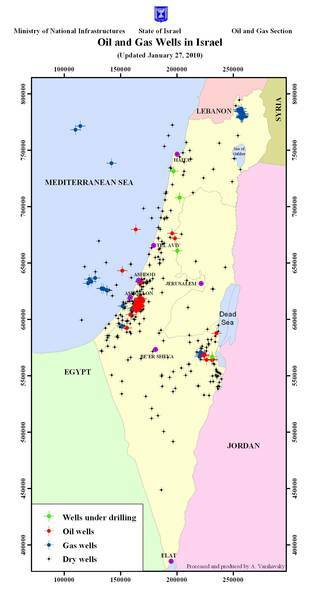 In 2009, there were large natural gas discoveries off the coast of Israel. In January 2009, the Tamar gas field was discovered, about 90 kilometres offshore from Haifa. Tamar is estimated to contain about 178 bcm of gas, a quantity equivalent to total forecast consumption in Israel for the next twenty years, according to the Israel Natural Gas Authority. The other major discovery of 2009 was the Dalit field in March of that year, 40 kilometres south of the Tamar field. The Dalit field has been initially estimated to contain about 20 bcm of gas. After 2009, gas production more than doubled, reaching 91.8 billion cubic feet in 2011. Likewise, natural gas consumption increased from 50.6 billion cubic feet in 2008 to 117.3 billion cubic feet in 2011. Proven gas reserves stood at 9.5 trillion cubic feet in 2013. Oil production is limited, with 5,839 barrels a day in 2012. Yet, oil consumption increased from 246,044 barrels a day in 2008 to more than 301,648 barrels a day in 2012. Proven oil reserves stood at 0.0115 billion barrels in 2013. Israel is a neighbouring and associated state of the European Union (EU). The relations between Israel and the European Union are framed in the European Neighbourhood Policy (ENP), the Euro-Mediterranean Partnership, and the Union for the Mediterranean. The main legal ties between Israel and the EU are established by the 1995 Association Agreement and several other agreement covering specific issues. The EU-Israel Association Agreement, signed in Brussels on 20 November 1995 and entered into force on 1 June 2000, is the legal basis governing relations between Israel and the European Union. 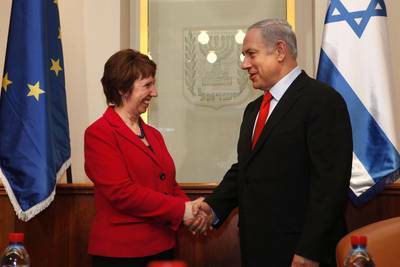 The Association Agreement established two main bodies for the EU-Israel dialogue. The EU-Israel Association Council (held at ministerial level) and the EU-Israel Association Committee (held at the level of senior officials) meet regularly to discuss political and economic issues as well as bilateral or regional co-operation. The main features of the EU-Israel Association Agreement include ‘provisions on regular political dialogue, on freedom of establishment and liberalization of services, the free movement of capital and competition rules, the strengthening of economic cooperation and cooperation on social matters. The agreement establishes an Association Council to be supported by an Association Committee. It also reinforces the arrangements for free trade in industrial products which had been in force since the late 1970s.’ The agreement also mentions many other areas of cooperation that are open to negotiation. Among other things, the agreement states that the respect for human rights and democratic principles guides the internal and international policy of both Israel and the EU and constitutes an essential and positive element of the Agreement. At Israel’s request, there is a Joint Declaration on the importance both parties attach to the struggle against xenophobia, anti-Semitism and racism. The EU is Israel’s largest trading partner; preferential agreements between the two parties are seen as an important step in their economic development and prosperity. In 2011 EU-Israel trade totalled USD 40.3 (EURO 29.4) billion – with exports from the EU to Israel at USD 23 (EURO 16.8) billion and imports at USD 17.3 (EURO 12.6) billion. In 2010 Foreign Direct Investment in Israel by the EU totalled USD 5.2 (EURO 3.8) billion Euros, a growth of 22.1 per cent compared to the previous year; Israel’s FDI into the EU increased by 394 percent in the same period. The EU has given Israel a privileged relationship by neglecting Israel’s failure to fulfil its obligations under the EU agreement. Article 2 of the Association Agreement referred explicitly to Israel’s human rights obligations under the Agreement: ‘Relations between the Parties, as well as all the provisions of the Agreement itself, shall be based on respect for human rights and democratic principles, which guides their internal and international policy and constitutes an essential element of this Agreement.’ Article 83 refers to the State of Israel only, thereby excluding products from illegal settlements on land which is occupied by Israel. Despite calls for the respect for human rights the EU has noted on numerous occasions the violations committed by Israel. The EU should activate Article 2 of the EU-Israel Association Agreement, which states that both sides must respect human rights as a pre-condition for cooperation between the two parties. On 19 July 2013, the European Commission stated in three pages of guidelines that it will end funding Israeli science as well as collaborations between European and Israeli scientists, including EU grants, prizes, and financial instruments that support organizations or activities in areas not under Israel’s control before 1967, which include the occupied West Bank, East Jerusalem, the Gaza Strip, and the Golan Heights, starting 2014.